Venetian glass is often synonymous with Murano glass.This type of glass is made in Venice, Italy, primarily on the island of Murano. Venetian glass is world-renowned for being colorful, elaborate, and skillfully made. Murano glass making has a history dating back as early as the twelfth century. This long history has perfected the craftsmanship and the end result is beautiful Venetian-Murano glass beads. 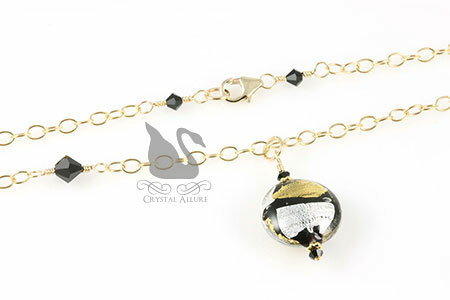 Such as this handmade bead pendant necklace. An abstract sterling silver and 24 karat gold foil Venetian glass pendant is paired with black jet Swarovski Crystals and vermeil gold Bali on a 14 karat gold fill chain. Necklace length is 17-1/4" with a 1-1/4" pendant drop.